As this afternoon’s main race began, a good start for Lowes saw him slot in behind eventual race winner, Alvaro Bautista, and reigning World Champion, Jonathan Rea on the opening lap. But while the Pata Yamaha rider had the speed to pull a gap on his pursuers and to match Rea’s pace, he didn’t quite have enough in reserve to overhaul the Irishman for second place. Rather than risk all for no gain, Lowes rode a fast and consistent second half of the race to secure his third consecutive podium of the weekend. The result consolidated Lowes’ third position in the championship standings with 69 points. 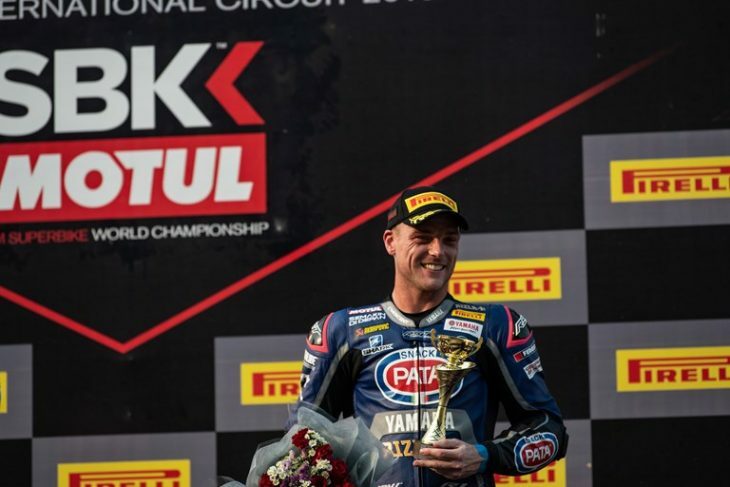 Van der Mark was made to work hard for his second fourth place finish of the day, after a slight mistake dropped him back behind Melandri, Cortese, and Leon Haslam early in the race. The Pata Yamaha rider managed to fight his way back through to again claim fourth place, which he held to the line with a slight advantage over his pursuers. Van der Mark remains fourth in the championship standings with 61 points, but with an increased margin over Melandri in fifth. Melandri was heavily involved in the battle for fourth place from the start of the race but again experienced some stability issues that have plagued him throughout the weekend and, despite some aggressive passes as he tried to challenge Haslam for fifth place, the Italian was forced to settle for sixth at the chequered flag. Melandri lies fifth in the championship standings with 54 points.